Your satisfaction is most important to us. If for any reason you are not completely satisfied with your purchase from Online Sports, simply return it within 90 days and the product cost will be refunded in full. Please contact Us or call us at 800-856-2638 to request a return authorization number. We can only accept returned packages that have an RA# written clearly on the outside of the package - packages without an RA# can not be accepted. Please note that products need to be in their original packaging and can not be in used condition. Customized Items, Special Orders, and items that have been installed or used are non-refundable. Items shipped by FREIGHT delivery may incur a 10% restocking fee. Our customers can tell you better than we ever can about our commitment to customer satisfaction and our desire to make sure you are delighted when you receive your order. "The site is great, very comprehensive... I was really happy to see that I could find a great site like yours. Here it's hard to find all these things and I'd probably use your services again. . . . "
"Fast, easy, great selection, and a previous order was taken care of and delivered as promised. Thanks, ONLINE SPORTS. I will continue to do business with you. I have many more helmets to collect." "I think you guys run a tight ship. Everything is brief and to the point. Two thumbs up for you." "A simple and awsome way to shop for sports memorabilia." "It has a lot of products that I've never seen before or wouldn't know where to look for." "Many many products! Shopping on-line is quick and easy!" "I liked the search capabilities and a wide range of resources. ...Good site for us hopeless sports enthusiasts." "I liked the easy way of finding the team I was looking for - good categories - good explanation of products - easy ordering . Thanks!" "This is like the fourth time I use this service with very good experiences. Thank you"
"I like the site and will certainly order more things in the near future. . . "
"I just recieved my Dodger alarm clock today, it is wonderful! Thank you for helping me out with my decorating!" "This way of ordering is very efficient. I liked how descriptive the information was about how successful people have been with the use of this site." "I think the site offers quite a variety of sports equipment. I will mention this site to my friends... 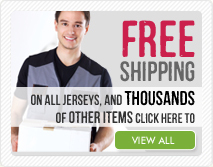 Thanks"
"You have a great selection of jerseys. Not a single retailer in Pittsburgh sells anything like this. The ordering process was very simple and straighforward. Thank you for giving me the option to send a check. Thanks"
"Very easy to follow. Thank you very much...I'll remember Online Sports"
"Very good service the last time I ordered so I'm back!" "Your site is GREAT! It's user friendly, you have many items to offer...impressive!" "I love the site. You cannot find much on this topic in libraries or book stores." "Had everything I could possibly want to order regarding the Buffalo Bills . . . Keep up the good work!" "I like this site, specifically the search engine - not all sporting good sites have such features." "I would like to thank you very much for the speedy and efficient delivery of my PNF Stretching manual. I will enjoy it. I will look forward in dealing with you in the near future. Sincerely,"
"Very comprehensive and easy to use. I would recommend it to others." "Great Site. Direct and to the point. Outstanding!" "I can find videos I can't find anywhere else." "Thank you very much. This amount is fine and I am pleased to recommend your company to anybody else requiring products that you supply. Thank you again!" "Dear Online Sports, I have already received my Orange Denver jersey. I am very pleased with the quality and the price! You can be sure that I will buy other products through your company. Again, thank you for providing a superior product at a superior price! Sincerely,"
" I would like to thank you for the fast shipping last time. I received the jersey Thuesday, which is pretty fast from the States to Denmark. Yours sincerely." "I recently ordered 2 authentic Penn State Football Helmets from Online Sports. I was very pleased with the merchandise. Thank you for the excellent service." "THANK YOU FOR THE FAST DELIVERY !!!!!!!!!! Rec today -6-18-98 !!!!!!!!!! Hope I win Sunday !!!!!!" "Just to let you know, I just received the two helmets. They're perfect! Thanks for all your help in filling our order and getting them here so quickly. It's great to actually place an order with a company and not only get what you ordered (miracle #1) but get it earlier than you requested (miracle #2)! Sometimes we forget that there are good companies out there that really do what they say they will do--thanks for reminding us! Thanks again--we really appreciate it!" "After surfing for nearly an hour on Yahoo, looking for someone to buy socks from. Voila, you were the first I found - who allowed me to purchase online. Thanks for making it easy to do business." "It was easy to find what I wanted from your catalog. Did you know you're the only place I could find horseshoes? I have searched all over to try to find the game, but haven't been able to find it anywhere!" "Easy to use. I liked seeing the awards you've won from the industry publications and of course, I liked the secure server." "The order was received yesterday. Thank you so very much for the rush. I will definitely use your company again." "Just wanted you to know that I got my jersey with no problems at all!! Thanks so much!" "Dear Online Sports, Thank you for your prompt attention to my order. I am indeed impressed!" "You were such a tremendous help to me, I appreciated it very much! . . . Thanks again for all of your help!!!!" "I liked the different types of videos avilable. I was able to find exactly what I was looking for." "I've been looking for a 36" wood baseball bat for years and you guys had it. Thank you!!!!!!!!!!!!!" "The only place I found that has exactly what I am looking for." "So far I am am impressed with the site . . . I am a first time credit card user for online purchases." "I think you are all doing a great job. I previously ordered some of your cards and I really enjoy their quality. Keep up the good work." "Good site! Have bookmarked it for future reference." "Got jersey. Thanks for your help - will definitely do business with you again." "I like the fact that it was easy to read and didn't require a lot of hassle to order. Also, the product explanation was detailed so I know it is what I need." "I received it. Thank you so much for the exceptional service." "I have ordered here before and was elated with the price and quickness of delivery." "The "search" option allowed me to find what I was looking for quickly and easily. It's a good site!" "The site works well and is easy to use. Most of all, I like the fact that you had these sandals...I've had a hard time finding them. Thanks." "I've been running all over town looking for one of these rebounders but I didn't know what they were called! 15 minutes on the internet I found it and at a very nice price! Excellent Selection of training aids!" "This is great! I wonder if my brother knows about it yet..."
"Your site is very well organized and I really like the search feature quite a bit. I think my friend will really enjoy what I am ordering from you. Thank you." equipment required for football is not easily (if at all) available in the UK. Thank you." "I like the systematic way everything is done. . . Shoes Clothing Gym Equipment"
"I thought I'd try to do all my birthday shopping over the net. I have not failed to find what I'm looking for yet! Thanks"
"Service was timely and easy, so I liked that. Also, responses to e-mail questions were prompt. Thank you." "Maybe THE best commercial shopping cart I have EVER seen!" "This has been a great experience--I have been unable to find this product in any sporting goods store." "The site is fantastic. I found the ordering process relatively simple." "Great. It contains everything i like. As an oversea hard -to-die 49-er's fan I'm happy to order directly from you. Goodies from the 49-er's are so hard to find in Europe. Thanks for your service. Greatings"
"Lots of cool stuff to choose from and good prices." "Very clear. Simple. Direct. And so far, it's flawless!" "Thank you so much!!! I will look forward to doing business with you again...I have three stepsons and two grandsons...and it's so fun to be able to do shopping online!!! Thanks again!!" "Hi there, Just a quick note to say that i have received that book already and thought that i would drop you a line to say thank you once again, and that it didn't take long to get to the land down under. Will recommend your services to all my kangaroo clients down here. Cheers for now. " "You guys got an oiler helmet for me previously that had otherwise been impossible for me to find. THANKS!!" "Today I was surprised when I received "The Rig". Talk about customer service, wow, you are there! . . . Very pleased. P.S. It's a great product! " "Great site with hard to find merchandise!!!!" "I received my new helmet case today. It was in perfect condition!! I am very happy with the service and hope to do business again in the future." "This is my second order. This is cheaper than buying from the local mall and you can get any favorite team. Good job!" "Hi! Thanks so much for your help. Because of OnLine Sports' continued excellence in customer service, I will continue to do business with you! Good day!!!" "I love the site...nothing at all wrong with it." "I think you did an excellent job on the useability and functionality of this web site. keep up the good work!" "Thanks so much - you have a great website and customer service." "Very, very convenient and secure!" "I wanted to thank you for having a hassle free ordering system, I found it very easy. Thank you"
"Excellent stock of products, unable to find this video anywhere else." "It's great! It's the only place that had what I was looking for. I look forward to doing future business with you guys." "You have very good prices." "Easy to find products, easy to order. You really helped with those hard to find Xmas gifts." "Thanks, Online Sports. I got my order yesterday! I appreciate all of your great help. Have a wonderful weekend and HAPPY THANKSGIVING!" "Love your customer service. There should be more people like you in the world. It would all be a better place. Go YOU!!!!"